This extraordinary plant will certainly be a talking point! 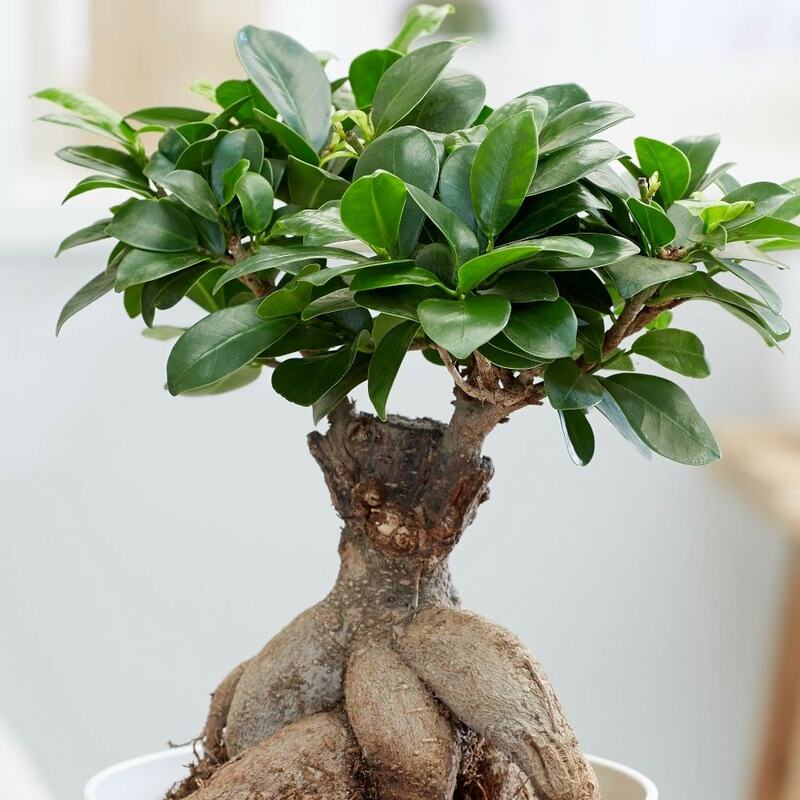 Ficus plants are one of the most popular plants for beginners to bonsai. Part of the Mulberry family there are many different varieties, but this one has amazing swollen roots that stand above the soil and pot, which are beautiful in their own way. Then on top, there is a mass of glossy, smooth, deep green oval leaves on short erect stems. Please note that the pot in the photograph is not supplied with the plant (which is sent out in a black plastic pot). They do however make excellent potted plants, and if you wish to pot yours up, we do have a wide range of pots on our website to choose from. 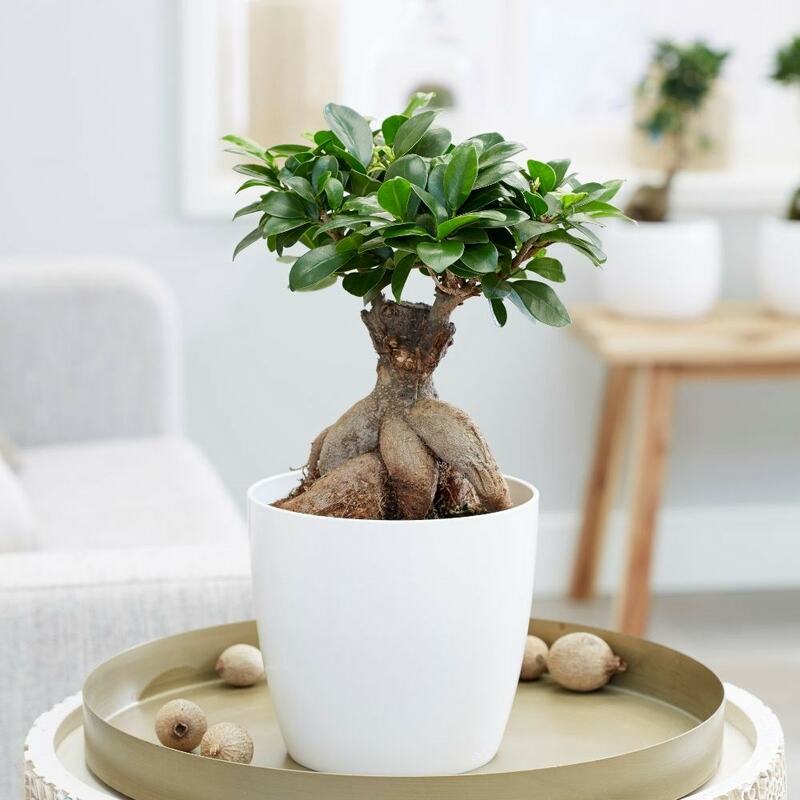 Home care: Bonsai trees are captivating and beautiful, and aren't as hard to grow as you might think as long as certain rules are followed. They need light, warmth, and water to do well. Place then in a light spot away from cold draughts with a constant temperature. Water with tepid soft water, or rainwater when the soil is just surface dry, - do the finger test regularly. They like a humid atmosphere so misting the leaves will help, and lightly trim regularly to keep the shape. If you move these plants, or there is a drop in temperature then they can drop their leaves, this can happen in the winter, but usually they will reshoot. Please note these plants are not covered by our plant guarantee.